The spread of Orthodox Christianity in the New World has occurred mainly as a result of immigration from Eastern Europe. There are two regions, however, where this is not the case: Alaska and the Caribbean. The story of the conversion of the Aleut, Tlingit, and Yupik nations in Alaska has often been told; by contrast, that of the yet more improbable emergence of Ethiopian churches in Jamaica is little known. My hope is that this little tract will inspire someone with greater knowledge to study the subject properly; if it also leads to a deeper respect and understanding between mainstream Christians and the often-maligned brethren in Jamaica, may the Lord be praised. Today the African Orthodox Church as such is largely defunct, although the parish of St. John Coltrane (!) in San Francisco remains quite active. THE CLASSICAL PERIOD: From 1930 until the mid '60s, Rastafari was a local Jamaican religious movement with few outside influences. Several Garveyite leaders had independently declared that Haile Selassie fulfilled Garvey's prophecy, and the movement remained dominated by independent "Elders" with widely varying views. Not only did no Jamaica-wide "Rastafarian Church" develop, but there was not even agreement on basic doctrine or a canon of Scripture--both the Holy Piby and the King James Bible were used by various Elders, but were freely emended and "corrected". OVERSTANDING: This "anarchy" was considered a virtue by classical Rastas. Rastafari was not a religion, a human organization, or a philosophy, but an active attempt to discern the will of JAH (God) and keep it. Classical Rastas were mainly uneducated Third World peasants, but they approached Rastafari in an almost Talmudic spirit, holding "reasonings" --part theological debate, part prayer meeting-- at which they attempted to find the Truth. Their attitude differed, however, from that of Protestants interpreting the Bible. They were certain that they would arrive, by divine guidance, at an "overstanding" (rather than understanding) of the Truth. The Truth cannot be known by human effort alone, but "Jah-Jah come over I&I", one can participate in the One who is Truth. The famous "dreadlocks" were worn during the classical period only by a minority of dreads, mostly those who had taken the oath of Nazirite. Very recent historical research suggests that the dreadlocks were popularized by a monastic movement which opposed the unrestrained and potentially corrupting power of the Elders. These celibate and almost puritanical "nyabinghi warriors" objected particularly to "pagan holdovers" in Rastafari, the continued use by dreads of ritual practices associated with the voudoun-like folk religion of the Jamaican peasantry. HINDUISM: Another source of "pagan" thought in Rastafari was the religion practiced by the thousands of East Indian labourers imported to Jamaica after the abolition of slavery. Classical Hinduism is a major religious force throughout the West Indies, especially on Trinidad, but its influence on Rastafari has been little remarked. The dreadlocked, ganja-smoking saddhu or wandering ascetic is a well-known figure in India, and bands of saddhus often live in Rasta-style camps and smoke marijuana from a formally-blessed communal chalice-pipe. The Hindu doctrine of reincarnation is also advocated by many dreads, although often with a subtle twist: to say that (for example) today's Jamaicans are reincarnated Israelites, and even "I myself have felt the slave-master's whip", means to some dreads not that they personally have lived before, but that their solidarity with their ancestors is so great that there is a "oneness through time". ETHIOPIANISM: I will now treat the issue of direct contact between Rastafari and the Ethiopian Orthodox Church. THE ETHIOPIAN WORLD FEDERATION (EWF): As an African country mentioned in the Bible and the only African nation to successfully resist colonialism, Ethiopia was always prominent in New World Black consci- ousness, but actual contact was minimal until the Second World War. In 1937, Haile Selassie's government in exile founded EWF to raise money and political support from Black nationalist groups in the West. After the war, the EWF continued to exist in various forms, some completely under local control but all providing at least some contact with Abyssinia. TRINIDAD & TOBAGO: In the 1940s, a Garveyite bishop named Edwin Collins set up what he said was a legitimate Coptic church under the Patriarch of Alexandria. However the Garveyite Coptics were tied more closely to the African Orthodox Church than to Egypt, and their canonicity was widely doubted. In 1952 the Garveyite Coptic diocese of Trinidad and Tobago broke away and placed itself under Addis Ababa. Clergy were imported from Africa and a fully canonical church was organised in the islands. Trinidad is an Ethiopian Orthodox success story: native- born clergy (including old-time Garveyite leaders) were rapidly ordained and parishes were founded all over the country and in Guyana. "GROUNATION DAY": Presumably because of the spread of the Ethiopian Church in Trinidad, Haile Selassie was invited to visit that country in 1966. Jamaica was then in the throws of an ongoing national social crisis in which Rastas were perceived by the establishment as a revo- lutionary threat which had to defused; a team of social scientists had advised the government that one way to do this was to foster close ties with the real Ethiopia. Accordingly, the Emperor was invited to make a stop in Jamaica. 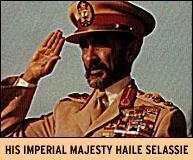 On April 21 -- "Grounation Day" to Rastas ever since -- Haile Selassie arrived in Kingston. Contrary to the widely repeated claim that the Emperor was "amazed" or "bemused" upon "discovering" the existence of the Rastafarians (the greater number of whom by 1966 believed him to be God in essence), there is much evidence that Haile Selassie's whole purpose in visiting Jamaica was to meet the Rasta leadership. Greeted at the airport by thousands of dreads in white robes chanting "Hosanna to the Son of David", Haile Selassie granted an audience to a delegation of famous Elders, including Mortimo Planno and probably Joseph Hibbert. The precise details of this historic meeting cannot be reconstructed, and there exist countless variants in Jamaican oral tradition. Almost certainly, he urged them to become Orthodox and held out the possibility that Jamaican settlers could receive land-grants in South Ethiopia. Most traditional versions of the meeting specify that he also gave the Elders a secret message, very much in keeping with the Emperor's known policies on Third World development: "Build Jamaica first." THE JAMAICA MISSIONS: In 1970, at Hibbert's invitation, Abba Laike Mandefro began to evangelize the Rastafarians in person. In the course of a year he baptized some 1200 dreads and laid the foundation for the church's subsequent growth. He also encountered fierce opposition from those Elders who taught that Haile Selassie was Jah in essence and demanded "baptism in Ras Tafari's name". In Montego Bay, only one dread accepted Orthodox baptism; Laike Mandefro baptized him Ahadu -- "One Man". EWF RASTAFARI: Besides the heretical syncretist groups, however, a legitimate Orthodox Rastafari Movement continued to flourish as the backbone of the Jamaican church. The EWF under the leadership of Dunkley and Hibbert had enormous prestige, being tied both to the roots of the movement in Garveyism and directly to Jamaica. The EWF retained the political and social aspects and the distinctive cultural features of classical Rastafari while advocating a rigorously correct and canonical Orthodoxy, venerating the Emperor as a holy living ikon of JAH but not worshiping him. The first steps toward Orthodox Jamaica were being taken -- albeit by people whose main secular goal was to leave the country as soon as possible! REGGAE: This was also the time when reggae music was at the height of its popularity, and when explicitly religious lyrics were the norm within reggae. Many popular bands were Orthodox, notably The Abyssinians, a group with priestly and monastic connections. The family of reggae's "superstar", Bob Marley, were mostly Orthodox, although Marley himself was for most of his career a member of the Twelve Tribes sect. In his last years, dying young of cancer, Marley underwent a remarkable spiritual transformation (evident in his music also) culminating in his baptism; his Orthodox funeral in 1981 was attended by tens of thousands of mourners. For whatever reason, in 1976 all Orthodox Rastas were required to cut their locks and to make an elaborate formal repudiation of heretical emperor worship (latreia). Whatever its long-term wisdom, this decree forced people who were "growing into an overstanding" by the slow traditional process to make a sudden decision; the cutting of locks, a purely external issue, seemed to many a repudiation of the movement's history. SYNCRETISM: In spite of these not-inconsiderable conflicts, the Ethiopian Orthodox Church has spread through the Caribbean thanks to the Ras Tafari movement. While only a minority of Rastas have actually become Orthodox, nearly all have been influenced by Orthodoxy. The makwamya (the prayer stick used by Ethiopian clergy) is ubiquitous among dreads; items of clerical garb are also frequently adopted. Rastafarian painters have been heavily influenced by ikonography. Syncretism is particularly evident in the organized sects which have partly supplanted the charismatic Elder system. THE TWELVE TRIBES OF ISRAEL (unrelated to the various Black Hebrew churches of the same name) are probably the largest and most famous of the sects. Founded in 1968 by Vernon Carrington (the Prophet Gad), the Tribes hold that Haile Selassie is Jesus Christ returned in majesty as King: the Second Coming has already happened. Their coherent theology and tight organization have won them many converts, including most of the famous reggae singers of the '70s. Something of the syncretistic feel of later Rastafari is conveyed by the cover art on the album "Zion Train" by Ras Michael (a brilliant hymnographer and one of the Ras Tafari Movement's more impressive living spokesmen). The painting shows two clerically-turbaned dreads before the open Royal Doors of an ikonostasis -- beyond which, however, is only a view of mountains against a red sky. CONCLUSION: I believe that the Rastafarians have been greatly underestimated by the outside world, including, to some extent, many elements in the Orthodox community. The classical Rastas were sophisticated theological and philosophical thinkers, not cargo-cultists worshiping newspaper photos of an African despot. They had discovered many sophisticated theological concepts for themselves, and had retraced many of the Christological and other debates of the early Church. They brought a truly rich cultural and artistic legacy, including some of the twentieth century's most moving hymnography..
Michael going to bring them, bring them to the Orthodox Church. No matter what they do, no matter what they say. Gabriel going to bring them, bring them to the Orthodox Church. Raphael going to bring them, Uriel going to bring them, Sorial going to bring them, Raguel going to bring them, Fanuel going to bring them, bring them to the Orthodox Church. These songs of freedom. This was the last song on the last album Marley released before his death.